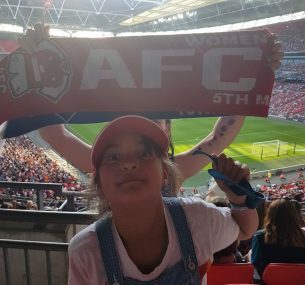 Phoebe just celebrated her eight birthday and six years since her tumour was removed. She has started to play the flute and learnt to ride her bike without stabilisers. Phoebe has just won a primary Shakespeare competition with her school friends who performed their own version of Romeo and Juliet. She enjoys drama, gymnastics, reading and playing with Sylvanian Families. It is now five years since Phoebe’s tumour was removed. Every year we email the surgeon to thank him and then we celebrate with a family dinner out. She will soon move to annual check-ups at the Marsden. 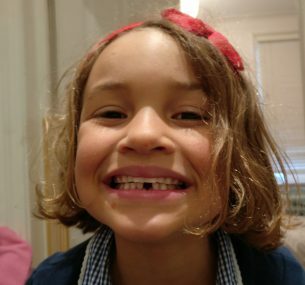 She lost her first tooth last month and has just finished her year 2 SATs successfully. She adores reading and particularly likes Enid Blyton, Gillian Cross and Jacqueline Wilson at the moment. She has had a few serious problems with digestive issues this year which have hopefully been resolved. Everyone worries more when she has any ongoing health problems and she gets lots of scans and follow-up care which puts our minds at rest. We are so thrilled she is well and got safely to seven. After playing in the paddling pool during the summer of 2012, a friend who is a health visitor mentioned that Phoebe’s tummy looked distended and felt hard on one side. We had all thought she had a typical tubby toddler tummy although I had wondered why skirts and trousers for older children were not fitting properly. After a visit to the GP, we were referred for an ultrasound scan a few weeks later but we still thought it was probably an intestinal problem. 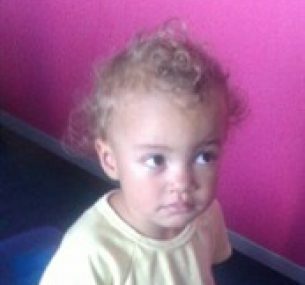 She had been eating slightly less for a while and vomited if she drank a large bottle or sometimes randomly in the morning, but she seemed perfectly healthy and all the above could be explained by toddler behaviour. A scan revealed a large abdominal mass from her left kidney. We then begged for a CT scan and went in through A&E to get that and additional tests carried out that day. She had really high blood pressure and small amounts of blood in her urine. By early afternoon our local hospital had been in touch with specialists from the Royal Marsden – we had a provisional diagnosis of a Wilm’s tumour and an appointment with an oncology consultant. The next steps were like a whirlwind. We needed a biopsy to confirm the cancer first, delayed as Phoebe developed chickenpox. We went to our local hospital to treat her with antivirals intravenously to get rid of it. We didn’t even realise we would have to stay in hospital as we thought she’d just get an injection or medicine. We were totally unprepared. We bought her a doctor’s kit after this experience and it has become her favourite toy. She constantly re-enacts various procedures she has had. One of her dollies even got a wiggly stuck on her by a community visiting nurse. A few days after the spots scabbed over, we had the biopsy and a portacath put in under her skin so she could be easily accessed. The constant cannulas put into her hands and feet had left her scared of medical staff. We called it the mushroom as it protruded out from under her skin, and with a bit of local anaesthetic ‘magic cream’, the process of blood tests and chemotherapy was made significantly less stressful for her. The day before her first pre-operative chemotherapy to shrink the tumour, I gave birth to her baby sister Zoe a week early. Her daddy stayed a few hours and then went off in the early hours to take her with her grandma to her first chemotherapy. The new baby developed pneumonia and was in special care at the start. Phoebe wasn’t feeling well with the side effects although she wasn’t sick as she had taken drugs to stop it. Her throat became sore and her voice went hoarse – it was heartbreaking to hear her on the phone. I was stuck on a maternity ward for five days unable to comfort her. She also totally lost her appetite and was lethargic. Phoebe had gone from an apparently healthy little girl to being sick. It took a month after treatment for her hair to fall out and she looked like she had cancer. We didn’t care as she was too little to understand and we just focussed on her fighting this. After the next chemotherapy a week later, Phoebe got a temperature. We were admitted to get antibiotics and tests to check the infection was not life threatening. This happened again twice and was really frustrating as we were not even sure if this was a side effect of the chemotherapy. We were not allowed to use paracetamol at home in case we masked a real infection. However, we understood why these precautions were taken. 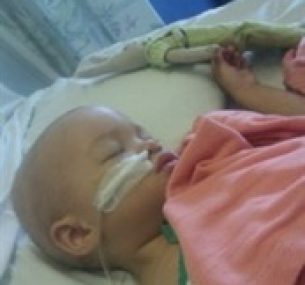 The tumour was successfully removed the day before her 2nd birthday and was 1.5kg! How could we have missed this for so long. Phoebe celebrated her birthday with a few ounces of milk and a banner with some helium balloons. A few weeks later, we got the news the cancer had not spread and we only needed another cycle of chemotherapy. This was the best present ever. Now we hope to have a happy ending. There will be regular hospital check ups for years and hopefully an operation to remove the portacath soon. Her immunity has improved so we have started reattending toddler groups and activities again. We just had her official 2nd birthday party two months late. Update on Phoebe; coming up to her third birthday! She has just finished her re-immunisations she needed after undergoing chemotherapy. She was very brave and has been busy jabbing her dollies and dinosaurs with her doctors’ kit to re-enact the experience. She has cancer checks every three months and is also having tests because of a fit she had in March. Phoebe had her portacath removed under general anaesthetic in February and is now always showing us her ‘beautiful scars’. We are starting to plan her third birthday and she has requested a chocolate ladybird cake. It seems a world away from last year but we still have questions about why it happened to Phoebe. We try not to be too anxious when she gets sick like any normal toddler, but it is difficult. 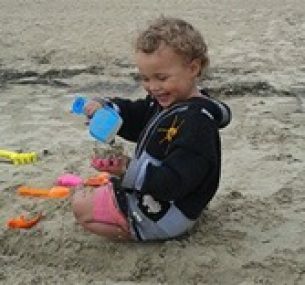 Phoebe starts nursery school in September and is a confident, happy two-year-old with a surprising medical vocabulary! Phoebe is now three years out of treatment and is in Year 1 at school. She has just moved to six-monthly check-ups at the Marsden, including an ultrasound. This is great news and is another tumour-free milestone that we celebrated. She loves her visits as she gets spoilt with a magazine from her parents, treats from the sonographers and a chance to play in the out-patients playroom. She makes us arrive early to fit this all in. Occasionally she asks difficult questions about cancer and about people we know who had it and died. I have gone for an honest approach and told her how lucky she is to have had brilliant treatment that killed all her tumour cells. We tell her she is one of the bravest little girls in the world and how proud we are of her. We still feel lucky every single day that we have her. A big milestone this year for Phoebe is moving to annual checkups from October 2018. 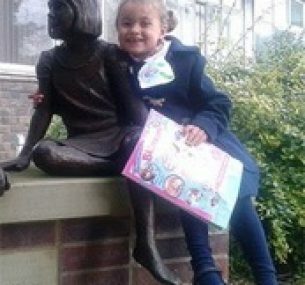 Phoebe is seven, her risk of a Wilms tumour reoccurring has decreased massively. She loves gymnastics, drama and reading. She is in a Shakespeare play at school in a few weeks. She has started playing the flute and loves it. She has been healthy this year which has meant far fewer GP trips, hospital visits and tests.